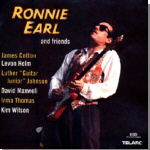 Guitarist extraordinaire Ronnie Earl is back in action with a group of his musical friends. The result is a fine album that easily qualifies as our Pick Hit of the month. The Surprise feature this month comes from veteran North Carolina bluesman George Higgs, with a release, Tarboro Blues, from the Music Maker Relief Foundation. Highlighted in the Flashback section this month is a collection of Little Milton's classic Chess recordings from the 1960s. This month's What's New section features new releases from Byther Smith, Big George Jackson, Precious Bryant, Jerry Portnoy, Big Jack Johnson & Kim Wilson, Mofro, Malkum & Chris, and Bill Perry, and a re-issue of classic Chess sides from Buddy Guy.